Keinuhevonen syntyi KOTTE TOYS-kitistä Maalasin sen valkoiseksi ja koristelin vähän ruskealla ja mustalla. 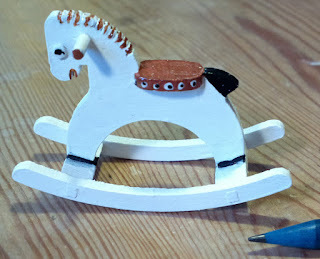 I made The Rocking Horse of KOTTE TOYS -kit. Painted it white and decorated a little with brown and black. You did a great job. What a great rocking horse. I lvoe the detail you painted on. It looks just perfect for any child to paly with for hours. Pero que preciosidad de caballito, quedaria genial en cualquier habitacion de bebe.